Kids don’t walk to school anymore. This evolutionary change from the standard practice in the 1950s, 60s and 70s is well documented and based on factors such as “stranger danger” and shifting housing trends. In recent years there has been push-back, and even federal legislation securing the right of children to walk to school alone. Students’ walking during school is another matter entirely, and for the past decade Cramer & Anderson has been a Gold Sponsor of the Sarah Noble Intermediate School Walking Project. Students in Joseph Raps’ fifth grade class participating this year in the Walking Project made a poster to show the four E’s: eating well, emotional health, exercise and environmental stewardship. Photo courtesy of Kelly Simpson. The four-week program each spring is designed to teach school children how to live healthier lives through walking, and as part of an educational experience that stresses the 4E’s: exercise, eating well, environmental awareness and emotional health. “In addition, it serves to foster school-community collaboration by inviting local businesses and organizations to partner with individual classrooms, mentoring the students and participating in healthful activities,” notes the Walking Project website. “We are encouraging kids to get out and exercise, eat right, respect the environment, and maintain emotional health,” said Cramer & Anderson Attorney Abigail Miranda, who is joined by Paralegal Kelly Simpson in walking with students in Joseph Raps’ fifth grade class. “We walk with them, we talk about healthy living, and we act as role models. We were all given pedometers to keep track of our steps,” explained Attorney Miranda. Partner John Tower meets part of his new walking team at the Walking Project’s 2014 Opening Ceremony. This year’s Walking Project goal is 52,017 miles. At approximately 2,000 steps per mile, that translates into roughly 104 million steps. If that seems unattainable, think again. The best part of the experience, all agree, is getting to interact with the students. Attorney Miranda and Mrs. Simpson walk with the class twice a week, for about an hour each time. This year’s Walking Project began May 3 with an opening ceremony and will conclude with a closing ceremony June 2. A photo of students walking from the Walking Project website. All of participating students’ steps, both at Sarah Noble and elsewhere, count toward the goal, as do steps taken by participating sponsors. Cramer & Anderson has been a Gold Sponsor since the beginning, and a list of all sponsors is on the Walking Project website. The Walking Project earned national attention in 2010 when organizers gave a presentation on the effort at the American Academy of Pediatrics convention. The initial objective was to challenge students in fifth grade to increase their level of exercise throughout the day by giving them pedometers and having them record in a classroom log the total number of steps they took. The success of the effort led to an expansion of its goals. 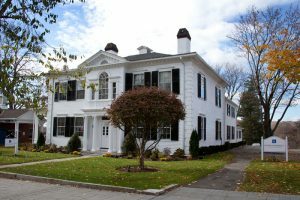 Attorney Miranda works in the firm’s New Milford office. Her primary Practice Areas are Divorce & Family Law, Personal Injury Law and Civil Litigation. She may be reached at 860-355-2631, or by email at amiranda@crameranderson.com. The firm also has offices in Danbury, Litchfield, Kent and Washington Depot. See the website at crameranderson.com for more information.